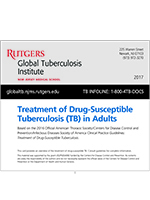 This pocket-size drug treatment card for clinicians provides an overview of management and treatment of drug-susceptible TB disease in adults, including medications, recommended regimens, monitoring, and treatment of TB in special situations. The card is based on the 2016 ATS/CDC/IDSA Clinical Practice Guidelines: Treatment Drug-Susceptible Tuberculosis. The PDF version is printer-friendly; to order a laminated pocket-size card please click on the link below.